The rush of learning a new skill. The flush of success when you finally solve a problem that’s been plaguing you for hours. The thrill of building something from scratch, and watching it succeed. This is what drives many people to hackathons. Student or developer, community advocate or a brand new company, everyone has an exciting time and learns new skills. Three years ago, it was this excitement that led Mike Swift and Jon Gottfried to found Major League Hacking. MLH is the world’s largest community of student developers, designers, makers, and community leaders on high school and college campuses. Major League Hacking hosts over 250 hackathons per year. Furthermore, over 65,000 students participate in 15 different countries across North America and Europe. As school ramps up and organizers start thinking about their next big event, I sat down with co-founder Jon Gottfried to discuss the value of hackathons and what led him and Swift to found a company around them. At its core, hackathons, and the people who attend them, are changing the world as we know it. Jon acknowledged that it’s hard to keep up! “The types of things these students are working on, even as young as high school, are pretty impressive and bleeding-edge and mind-blowing,” he said. It’s all true – a hackathon is a fun and exciting and invigorating place to spend the weekend. You’ll go home sleep-deprived and a little stinky. However, you’ll come away with new skills, having played with real-world, in-use technologies. So there’s obvious value for the attendees, but what about for the companies sponsoring the event? There are two different categories of value that Jon laid out for me, depending on your role at an event. If you’re a recruiter, you’ll get a chance to see students showcasing not only the skills that they already know, but their ability to learn new skills and figure things out on the fly. This, as Jon says, is often a more valuable component of that trade. If you’re a developer evangelist or someone from the product team, you’ll get to see someone using your product from start to finish. You’ll also be able to receive real-time feedback about your product’s UX, UI, and functionality. Their mission is quite literally written into the company’s operating documents, which holds them to a higher standard than most. “It helps us maintain a level of understanding both inside and outside the company of what we need to do to uphold those values,” says Jon. That’s not to say they need the B Corps standards to motivate them to put community first. Throughout the interview, it was obvious that the hacker community comes first in all things that Jon does with MLH. “A lot of the things that we provide at events, the ways we talk about our community, the ways we talk to our community, is really in that vein of putting the hackers needs first, and finding ways to leverage our resources to make their lives better,” he says. Hackathons are changing the world as we know it, but they’re doing it one company at a time. At SparkPost, we’ve had an opportunity to participate in quite a few different hackathons. The amount of feedback we’ve received from students and other companies alike is invaluable. Connecting with students as they figure out what they’re building, why they’re building it, and how all of the pieces hook together is not only fun, it’s enlightening for us as a team. This gives us the opportunity to continue improving on our API to make it even better for years to come. 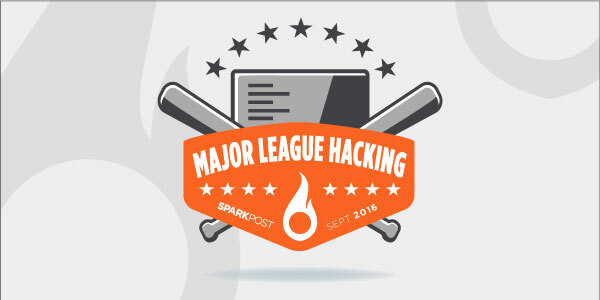 Interested in learning more about Major League Hacking or getting involved in one of their hackathons? See mlh.io for more information. Also, keep an eye on developers.sparkpost.com to see what hackathons we’ll be at in the near future.